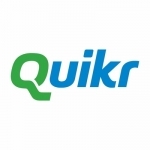 We have an urgent opening for Key Accounts Manager- for software sales in Quikr.com(Realty Redefined). This is an onroll job. You will be responsible for driving customer acquisition, activation, retention, revenue and renewal. You will handle end-to-end client relationships including pitching, negotiation, contracting, billing / invoicing, payment collection and troubleshooting. Note- Please apply if you have experience in Selling digital marketing solutions / Software or website or mobile application sales even candidate from real estate background can apply.